This rocking chair is a great addition to any room in your home, especially a bedroom or nursery. Complete with a buttoned back, extra cushioned seat for comfort, and covered arm rests for the ultimate in relaxation. 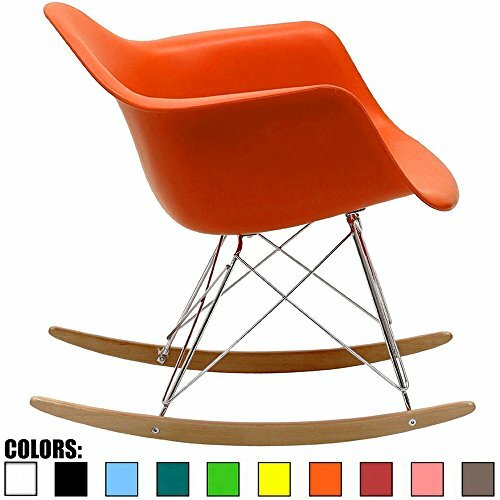 With a mid-century design to complement any décor, this rocking chair is sure to please. 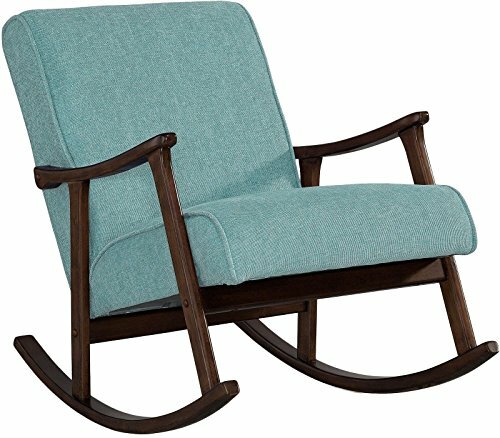 Product Details Includes: One (1) Rocking Chair Material: Fabric Composition: 100% Polyester Frame Material: Birch Color available in: Grey, Muted Blue, Muted Green, Muted Orange, or Wheat Frame Finish: Light Walnut, Assembly Required Dimensions: 32.50"D x 25.50"W x 34.25"H Seat Width: 21.25" Seat Depth: 21.50" Seat Height: 19.00" Arm Height: 26.00"
Inspired by mid-century modern design, the Yashiya rocking chair has blended the retro feel of a vintage upholstered rocking chair with the quality, made-to-last design you'd expect from a modern piece of furniture. The result is our exclusive Yashiya Rocking Chair. Featuring polyester fabric in grey and a sturdy wood frame in a beautiful walnut finishing, this retro rocking chair feels right at home in a nursery, living room or any shared space. High back contoured design and ergonomic arm height add more charms to this piece. The Yashiya looks smart, modern, but comfortable can be a good rocking chair for nursery during middle of the night feedings and yet a pretty piece of furniture to accent the room. Made in Malaysia, the Yashiya requires assembly. 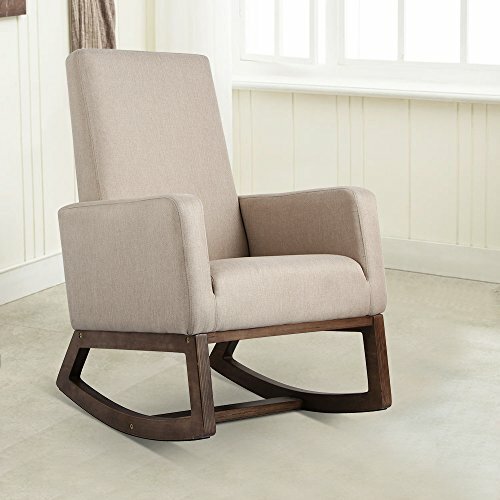 Sophisticated style and smooth, calming lines come together in the Martine rocking chair. 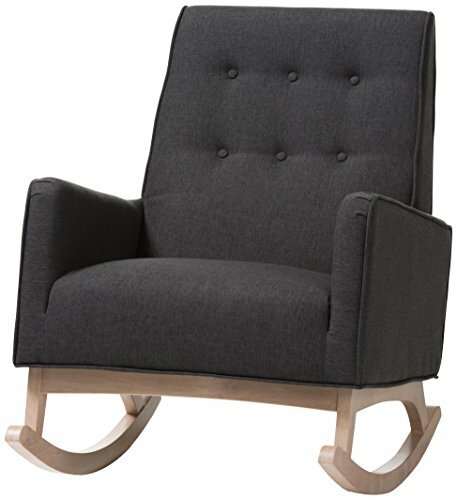 This mid-century modern-inspired rocking chair features dark grey fabric upholstery with button-tufting details and a subtle piping design. The low-profile Martine rests on solid, whitewashed rubberwood legs. This rocking chair is foam padded, with the arms at an ergonomically designed height to make it easy to get cozy and stay relaxed. The Martine is a stylish and comfortable addition to your nursery, living room, or any shared space. Made in Malaysia, this rocking chair requires assembly. Sophisticated style and smooth, calming lines come together in the Martine rocking chair. This mid-century modern-inspired rocking chair features greyish beige fabric upholstery with button-tufting details and a subtle piping design. The low-profile Martine rests on solid, whitewashed rubberwood legs. This rocking chair is foam padded, with the arms at an ergonomically designed height to make it easy to get cozy and stay relaxed. The Martine is a stylish and comfortable addition to your nursery, living room, or any shared space. Made in Malaysia, this rocking chair requires assembly. Add charm to your home with this gorgeous wooden rocker. A high-back height and generous cushioning lets you relax in complete luxury for hours on end. This retro chair features a solid wood frame upholstered with a foam filling for maximum comfort and stability. With a medium walnut frame finish and an aqua-colored upholstery, this lovely chair is sure to complement the decor in any room with a hint of mid-century glamour. 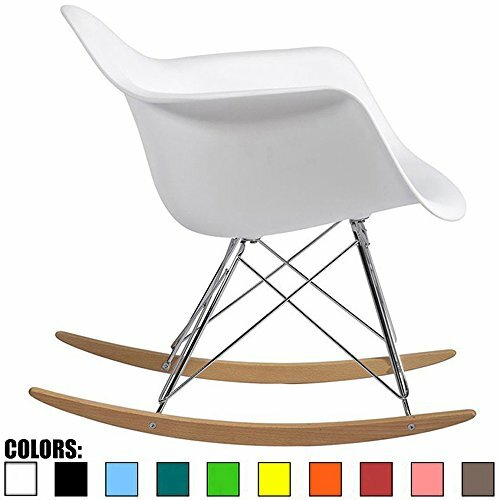 Best Choice Products is proud to present these brand new Plastic Rocking Armchair. 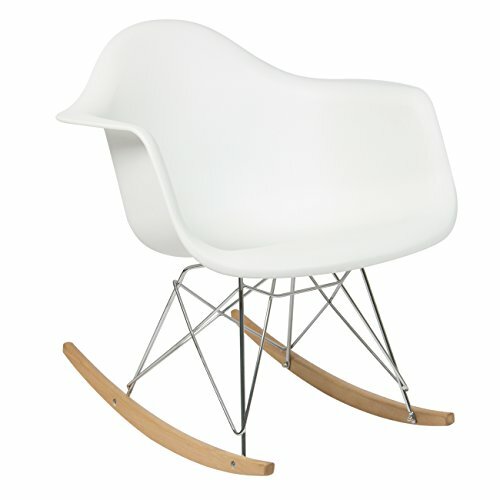 This chair take a new spin on the classic rocking chair and will provide a new modern avant garde style to your room. The top of the chairs are made out of heavy duty plastic that can support weight up to 275lbs. The seats provide ample room, creating a comforting rocking experience with built hand rests. They contain chromed metal support bars that have been arranged in an architectural edgy design that enhance the modern stylish vibe of the chairs. Lastly, the chairs contain ash wood rockers that will nicely blend with other wooden furniture in any room. We purchase our products directly from the manufacturer, so you know you're getting the best prices available. NEW PRODUCT WITH FACTORY PACKAGING. SPECIFICATIONS: One stylish chair, Overall dimensions: 25"(L)x 24"(W)x 27"(H), Weight: 12 lbs., PLEASE NOTE: Our digital images are as accurate as possible. However, different monitors may cause colors to vary slightly. Some of our items are handcrafted and/or hand finished. Color can vary and slight imperfections in the metal work are normal and considered evidence of the hand-finishing process, which adds character and authenticity to those items. 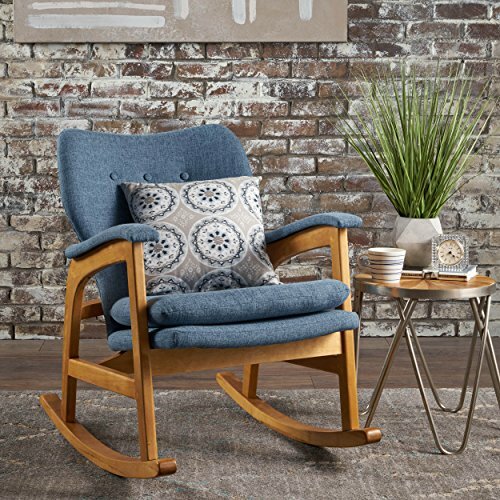 Inspired by mid-century modern design, the Esright rocking chair has blended the retro feel of a vintage upholstered rocking chair with the quality, made-to-last design you'd expect from a modern piece of furniture. The result is our exclusive Yashiya Rocking Chair. Featuring polyester fabric in grey and a sturdy wood frame in a beautiful walnut finishing, this retro rocking chair feels right at home in a nursery, living room or any shared space. High back contoured design and ergonomic arm height add more charms to this piece. 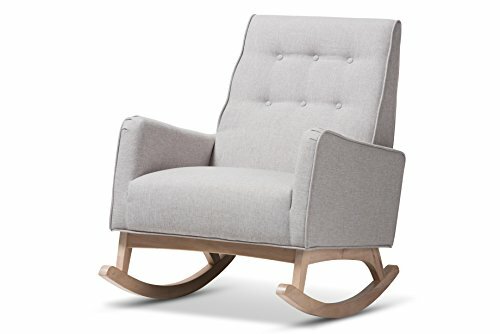 The Yashiya looks smart, modern, but comfortable can be a good rocking chair for nursery during middle of the night feedings and yet a pretty piece of furniture to accent the room. 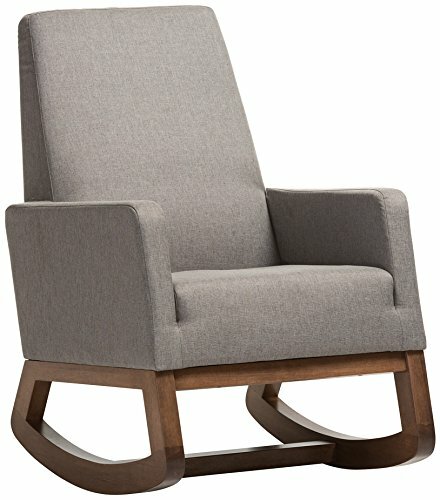 Compare prices on Rocking Chair Mid Century at ShoppinGent.com – use promo codes and coupons for best offers and deals. Start smart buying with ShoppinGent.com right now and choose your golden price on every purchase.